H-CAN's core missions center around Action Groups. Our Action Groups, each focused on specific areas, create events and actions to spur progressive change. Want to join an action group? Join H-CAN or contact us for more information. The Arts Advocacy Action Group promotes and supports art in all its forms, and works to ensure the long-term sustainability of the arts at the local, state, and national level. We achieve this through organizing both family-friendly and adult arts outings, using art as a tool for advocacy, and by keeping up on current legislative issues that threaten to take away funding for or access to the arts. We welcome anyone who has a passion for the arts and who believes that art is fundamental to society. Reader more about the Arts Advocacy Action Group. into several subgroups to work on political engagement at the national, state, and local levels. Some of these Civic Engagement subgroups work exclusively within H-CAN while others act as liaisons to external groups. In keeping with Indivisible's mission of resisting the Trump agenda by holding Congress accountable, our activity is directed toward our particular members of Congress. We plan actions (including protests, rallies, get-out-the-vote events, voter registration, and letter-writing campaigns) and strategize with other activist groups to communicate with our members of Congress. The Indivisible group also chooses which of the Action Items listed by Indivisible at the national level are the highest priority and will be the focus of general H-CAN Calls to Action. If you agree that the influence of special interest money is corrupting both parties in our government, join the Wolf-PAC fight—using a pathway built into the Constitution by our founding fathers to bypass Congress and even the SCOTUS entirely. March on Harrisburg is an all-volunteer, non-partisan group of Pennsylvania residents who are concerned about the broken trust between voters and their legislators. We encourage public support for three bills that we believe can begin to reestablish trust with our elected officials. These important bills are the popular redistricting reform commission (gerrymandering), a gift ban for legislators, and automatic voter registration. We believe that participating in our local government meetings is essential. The Civic Engagement Local Action Group focuses on promoting progressive leadership in our township, as well as having a presence at every School District of Haverford Township board meeting and Township Commissioners meeting. support the rights of these community members. We focus on ensuring that disability rights are respected and access to community events and services are readily available and communicated clearly. Read more about the disability and accessibility action group. environmental awareness and protections on the local, state, and national levels. Our focus includes pressing issues relating to quality of air and water, wildlife protection, environmental education, and community engagement. Read more about the Climate action group. The Family Programs Action Group explores ways to engage children and youth in our progressive issue areas. We plan programming to educate children about social justice and we explore ways children can be activists and advocates in their own right. We hope, no matter what committee you join, you’ll think of ways young people can be involved. The Giving Circle Action Group's goal is to mobilize H-CAN members to give financially to identified organizations six times a year. Every two months, the Giving Circle identifies an international, national, state, or local organization whose mission and goals coincide with our own. Often we identify organizations that are working on "hot" issues affecting our nation and community. The Immigration and Refugee Action Group seeks ways to support our local refugee and immigrant communities and fight anti-refugee and anti-immigrant policies and legislation. We also seek to foster more welcoming, understanding and compassionate connections between citizens and new arrivals. 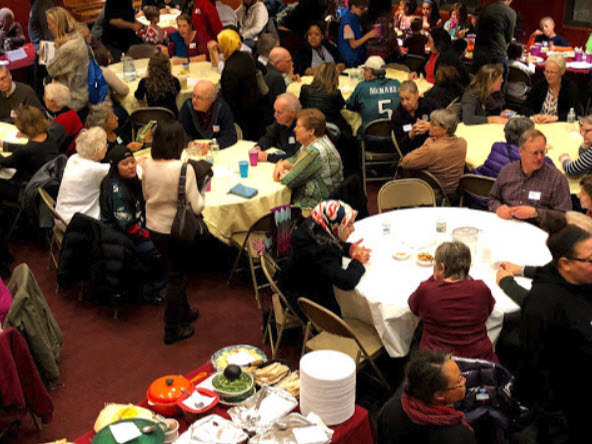 We seek to encourage understanding by presenting educational events about various faith traditions and coming together to share social time and consider deeper questions relating to faith and activism. The LGBTQ+ Action Group seeks to support and advocate for community members who identify as lesbian, gay, bisexual, transgender, questioning, queer, intersex, asexual or pansexual, as well as their family members and allies. Our goal is to cultivate acceptance through action at the local, state and national levels and encourage conversations that help us explore and embrace diversity in our community. We also offer outreach, support, education and socialization opportunities for people of all ages, orientations and identities. works. More ideas and people committed to taking action are always welcome! Read more about the Racial Justice action group. increasing women’s participation in government at all levels, supporting reproductive rights, advocating for comprehensive health care, and advancing economic equality. We’re interested in promoting legislative action to support our areas of interest and sharing timely information about events and readings. It’s not just for women!